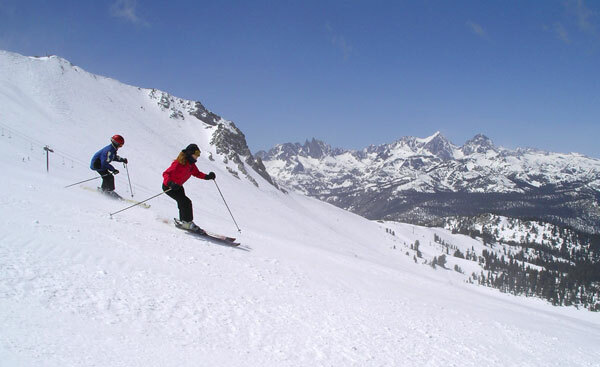 Mammoth, as its name implies, is the biggest ski area in the grand state of California. Mammoth is known for hosting the longest ski season (opening early November and skiing into June), building the best terrain parks and events, and getting epic quantities of snow. Mammoth ski stories should be in every serious skier’s quiver. The remote eastern Sierra Nevadas are known for their monstrous peaks, and the serious snow storms that laden them with western snow dumps measured in feet not inches. This mountain called Mammoth has challenge enough for the very best, it has tons of terrain for every member of your riding and skiing family, steep and deep fro experts, groomers, and serious terrain parks for riders and free skiers. There’s a relaxed California vibe in the self-contained Village at Mammoth which is not glamorous or European alpine, but its sufficient and slopeside. A YotelPad brings mod accomodations to Mammoth, with minimalist lodging, and apres ski in its funky lounge. Other wise Mammoth has lots of convenient condos in the village, steps to the gondola, shops nd restaurants. Mammoth is party-central come spring, dubbed teh King of Spring, but families will find a fun-loving atmosphere all season long with mascot Wooly the Mammoth and excellent kids ski programs.